When the Philadelphia Eagles finally clinched their first Super Bowl title Monday night, many celebrating fans' thoughts drifted to loved ones who couldn't be there to witness it. 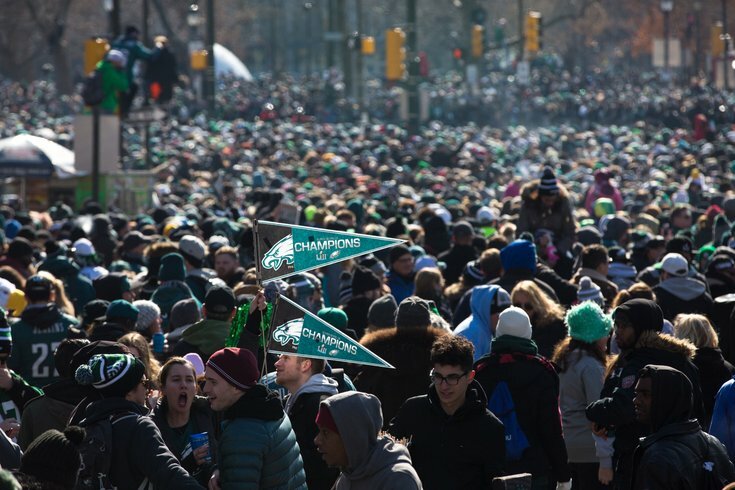 One Eagles fan highlighted what a Super Bowl in Philadelphia means to some die-hard supporters when he brought his father's ashes to Philly for the Eagles' celebration parade on Thursday and scattered them along the parade route. Wearing a green Eagles visor and Jerome Brown's white No. 99 jersey, the fan, identified by Tampabay.com as Todd Satinoff, was shown pouring out the ashes of his father, Carl Satinoff, in a video posted to Twitter by Bleacher Report. The video has since been shared by thousands. Todd Satinoff, who was born in Philly and moved to Florida in 1998, told the site that his father was a devoted Eagles fan who died in 1994 at age 59. "It was an epiphany moment. It was incredible," Satinoff, 50, said. "It's hard to put words on a value of something like that. It's so personal, but I think a lot of people can relate to it."